For many years, one of the most arduous and difficult residential plumbing tasks was repairing damage to sewer and water pipelines. Even a small crack or leak in either line required the work of plumbers to dig up the yard around the house in order to reach the pipe. However, thanks to pipe lining, you don’t have to go through immense hassles to have these crucial pipes fixed. Resolve Trenchless offers this speedy and effective service for homes in Warminster, PA. If you have any suspicions that your water or sewer line is leaking or deteriorating, contact us: we will take care of the fast pipe lining services that will protect your plumbing and cause as few headaches as possible. The plumbing professionals at Resolve Trenchless offer excellent pipe lining services in Warminster, PA and the surrounding areas. The water and sewer lines are two of the essential components of your home’s plumbing system. Any sort of problem with either will quickly become a major issue, leading to a complete loss of fresh water or sewage backing up into your home. In short: without a water or sewer line, you don’t have a working plumbing system. However, because both pipes lie inside trenches underground, trying to repair them using standard pipe replacement techniques involves large digging projects that tear up property and require days of work that disrupt regular routines for an entire household. But if you call on professionals who provide pipe lining services, they will have the sewer or water line fixed in a matter of hours with very little interference in your daily life. What Does Pipe Lining Involve? From the inside of the house, the plumbers detach the line they are working on (sewer or fresh water) from the home’s plumbing. They then slide the new liner into the pipe opening. Outside of the house, the plumbers dig a small hole to access the other end of the damaged pipe and detach it from the municipal water/sewer system. A hydraulic device is then fit onto the end of the pipe, and it draws the reliner all the way through the pipe and sets it into place. The reliner provides a new, solid interior for the pipeline that takes care of cracks and leaks. All the plumbers need to do after this is to reattach the pipeline and fill in the single hole they dug. Because your sewer and water lines are out of sight, you have to pay attention to indirect indications that they have sustained damage that makes relining necessary. Watch for damp puddles appearing on the yard that you can’t account for. Sewer line trouble will start to cause sinks and toilets to back up around the home and make clogs into a regular annoyance. A bad water line will lead to a drop in water pressure and the appearance of discoloration in the water coming from the taps. When you notice any of these signs, call for professional plumbers. They will discover whether you need pipe lining or perhaps a full pipe replacement. Resolve Trenchless is a leading provider of trenchless "no dig" services in Warminster, PA. 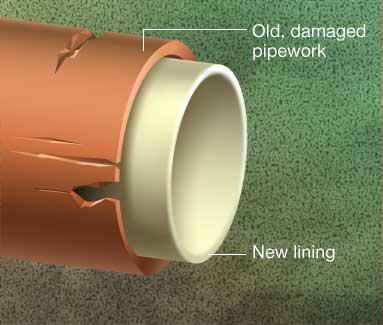 If you think you need to have pipe lining done, give us a call and we will schedule the work for you.